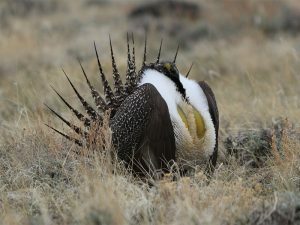 A partnership to protect the greater sage grouse in Wyoming. The Upper Green River Conservancy ™ is the nation’s first co-op conservation bank created to restore and manage healthy sagebrush landscapes while providing for energy development and continued ranching. The Upper Green River Conservancy Co-Op Conservation Bank™ (UGRC) is an innovative partnership of energy companies, ranchers, conservation stakeholders, and impact investors working together to ensure the protection of core sage grouse habitat in the ecologically and energy rich Upper Green River watershed in southwestern Wyoming. For energy companies and developers, UGRC establishes a market based solution to offset the environmental impacts of development. The groundbreaking new model rewards ranchers for conservation practices and establishes critical unfragmented, landscape level protection of valuable habitats and ecosystems. UGRC provides energy companies and other organizations pursuing development the ability to achieve net conservation gains required by State and Federal regulators, and positions Wyoming to sustainably develop its substantial energy resources. For more information on The Upper Green River Conservancy click here or read more on the history of the Green River Basin.